Everyone has that favorite dish that their Grandma used to make. For some people it’s a Sunday sauce, for others it could be lasagna, or stuffed cabbage, or apple pie… For me, from my mother’s side of the family, it had always been pierogies. My Grandma and Grandpa Petryshyn turned me into a veritable pierogi junky very early in life. If someone let me back in the day I would have hunkered down and eaten a dozen of them, at least! So for some reason I was a little nostalgic yesterday and found that I kept thinking about my adorable little Grandma who passed away a number of years back, and my Grandpa who lives half a country away, and it became resoundingly clear to me what I had to make for dinner, my favorite meal with them, pierogies. The thing is, I wanted to do something different. While I was absolutely obsessed with their delicious little chewy pockets of potato and sour cream goodness when I was a kid, I find that 20 years later I’m looking for something… else. Don’t get me wrong, I would happily eat their pierogies on a regular basis, but if I’m making them I want a twist, a play on flavors and textures… a little more balance. 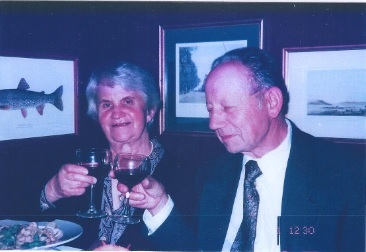 So here is my own pierogi recipe, in homage my beloved Grandma and Grandpa Petryshyn. One quick note… If you don’t want to make the dish the way I made it and are looking for something more traditional, then you’re still good to go with this recipe. Just don’t top the dish with the tomato, jalapeno, arugula, oil and lemon. What you’re left with would be a traditional pierogie dish with sautéed onions and garlic in butter. Just be aware that this pierogi dough is a little different than typical… it’s less doughy, has more crunch to it. Ok so the first thing we have to do is make the filling for the pierogies, because it needs to cool before you can put everything together. Boil your peeled potatoes, drain them and then whip them with the salt, pepper, garlic powder, sour cream and shredded cheddar cheese. Once fully blended put the bowl in the fridge and allow to cool, about 1-1.5 hours depending on your refrigerator’s temperature setting. While the filling is cooling down it’s time to make the dough. Traditionally you would make it in a bowl by hand, but this is the 21st century people. God invented Kitchen Aids for a reason! Put your flour in a mixing bowl. In a separate bowl whisk together your eggs, water and 1tsp of olive oil. Add to the flour and mix, starting slow and moving up to a medium speed, as you’re mixing slowly add the remaining 2tsp of olive oil. Once mixed turn your dough out onto a floured surface and knead until smooth and elastic, approximately 8-10 minutes. You may need to use a little force while kneading… it’s not uncommon for me to punch it, literally. Wrap in plastic wrap and let rest at room temp for 30 minutes. Alright… you’ve now let it rest 30 minutes, it’s amazing how time flies! If you’re lucky enough to have a pasta attachment for your Kitchen Aid, good for you, go ahead and use it. If you don’t, like me, get ready to use some muscle and do it old school. Turn the dough back out onto a lightly floured surface, cut it into quarters and start rolling it out. Your goal is a thickness of roughly 1/16 of an inch. Once you’ve achieved that use a ring mold to cut out circles and set aside, I used a 3.5″ mold. Take your surplus dough, knead back together and start over. You should be able to get approximately 24-28 pierogies from the batch. So let’s stuff the pierogies. First, get a bowl of cold water and a fork. Take your dough circles, one at a time stretch them out a little, place a spoonful (I use a teaspoon, not the measuring kind, the stir your coffee kind) of the filling in the center. Wet the edges with water, stretch and fold over. Use the fork to crimp the edges. To get rid of any excess dough I use the ring mold to cut the edges down closer to the filled center. Set aside on an oiled plate (so it doesn’t stick to the plate, and they don’t stick to each other). To cook the pierogies you’re likely going to have to get them started in two or three batches, depending on how big your largest sauté pan is, but you’re finishing in the oven so everything will be done at the same time. Heat a large sauté pan at medium-high heat and melt your butter. Add as many pierogies as you can without them being crammed too close together. Cook until lightly browned then flip and repeat. Remove from the pan and put in a 9.5×13 baking pan. You may need to add a little more butter in subsequent batches… Once all of the pierogies are cooked and in the baking pan, lightly cook your onion and garlic in the same sauté pan until they start to sweat, then layer them over the pierogies. Cook the pierogies in the oven for 10 minutes. Once done go ahead and plate them up, top them with the diced tomato and chopped jalapeno, then place the arugula on top of that. To finish the plates lightly drizzle them with extra virgin olive oil (about 1tsp for each plate) and fresh squeezed lemon juice. Now let’s talk wine. I would recommend a medium-to-full bodied red in this scenario, especially something with moderate acidity to play with the tomato and lemon, as well as some garden green notes to work with the jalapeno. The first wine listed is what we had with dinner, and it was perfect. 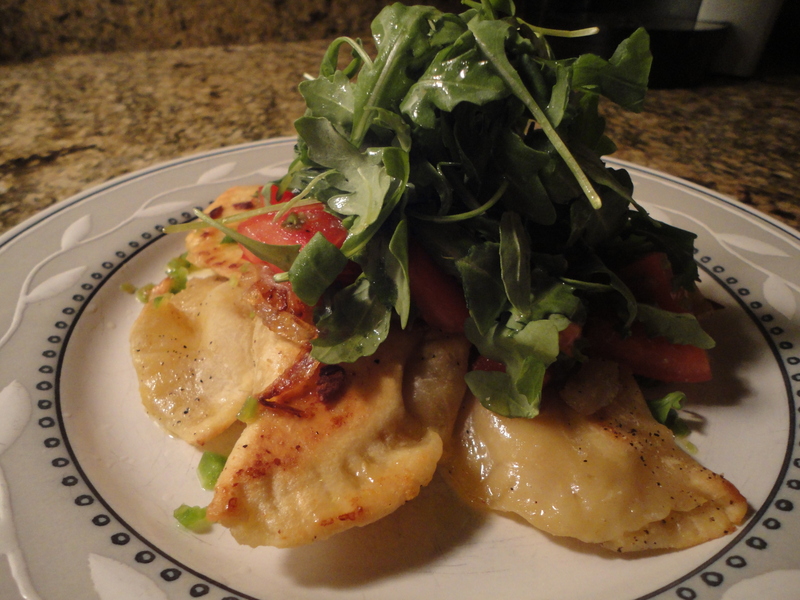 So that’s my pierogi recipe, with some crazy toppings, and my recommended pairings. I hope you enjoyed the read, and I hope you enjoy the recipe. New content will be coming soon, but in the meantime crack open a bottle of something funky, sit back, and relax. Life is short, enjoy it! 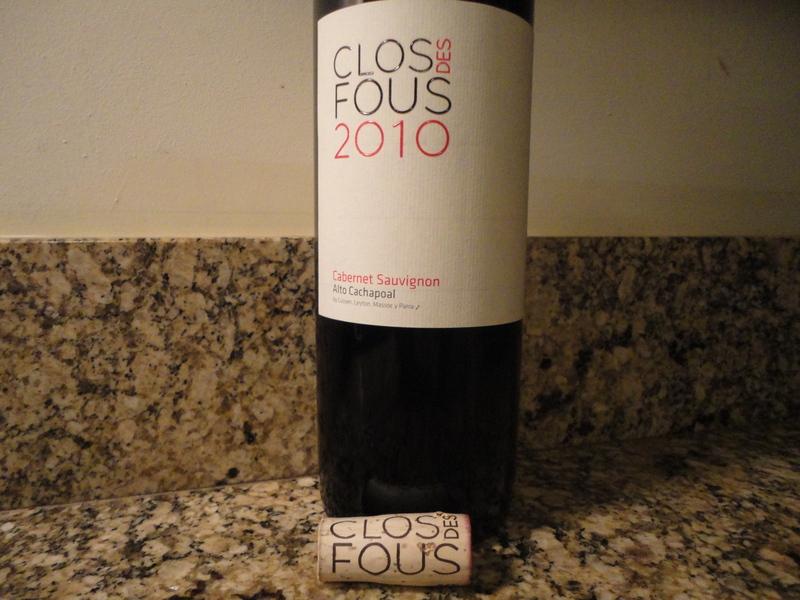 Tags: chais st laurent, clos des fous, foxglove cabernet, homemade pierogies. Bookmark the permalink.